It’s been a while since I did a beauty post, and I am sticking to the same products these days. But I did find two new favorites over the holidays, and they were a happy surprise. The first is Hourglass’ Ambient Lighting Powder in Diffused Light, which I bought on a whim after reading great reviews. I don’t normally use illuminating powder these days, since I have oily skin, but this specific color is designed to reduce redness and oiliness, so I gave it a try. 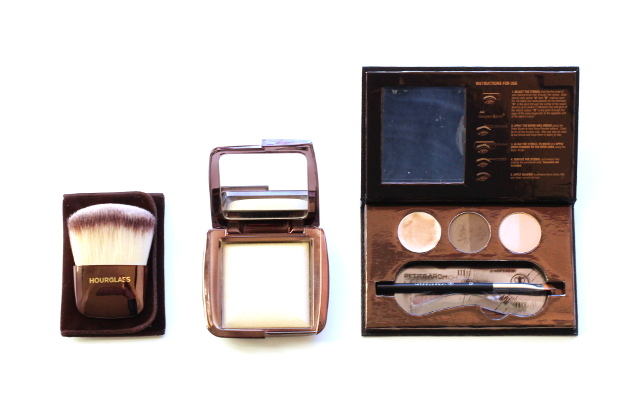 I put it on after my regular pressed powder, using the Hourglass brush to highlight certain areas of my face. The result is light and subtle, and a great way to add a bit of freshness during the winter. I found some great YouTube videos that explain how to use the product best, and I watched a few for inspiration. The second, Anastasia Beverly Hills Beauty Express for Brows and Eyes, was a Christmas gift from my sister and I absolutely love it! In fact, I can’t believe I’ve gone this long without it. I like to draw attention to my eyes when I do my makeup, but I’ve always ignored my eyebrows. They are pretty average and low-maintenance, but since I stopped coloring my hair, I’ve felt the need to darken them just a little. This kit has everything I need to create slightly darker, but still refined brows, and I’m a huge convert to the Anastasia brand, which I’ve heard about for years. The little box comes with eyebrow wax and color, as well as illuminating eye shadow and brow stencils. I don’t use the stencils or the shadow, at least not yet, but the wax and lighter brow color are my new favorite products, hands down. The kit’s brush makes the wax and color application so easy, and it’s a quick step that I’ve added to my beauty routine each morning. I’m really thrilled with how well everything lasts all day long, and I will never be without this kit again, it’s that good. Did you try any new products over the holidays or find something that you can’t live without? I need to get some more translucent powder. I’ve been using Mary Kay mineral powder, but unfortunately a lot of the powder gets trapped under the plastic under the lid, and I hate letting it go to waste! I had a powder container that did that, and I read a suggestion to punch more holes in the filter part. That seemed to work for me. I picked up a brow liner that I actually like — it’s by a Canadian company called Annabelle, and it actually sticks. I’ve been growing my brows out since summer so it’s a must-have fo rme! That’s great! I love finding new products that work so well!